Facing a myriad of challenges from digital transformation, business today are making big bets on the best collaboration tools they need on hand to meet those challenges. From employee buy-in, to machine-learning capabilities, to security, it's important to select a service with the right capabilities to further your business goals. The challenge, however, is that with so many services to choose from it can be difficult to figure out which one is the right fit for your business. 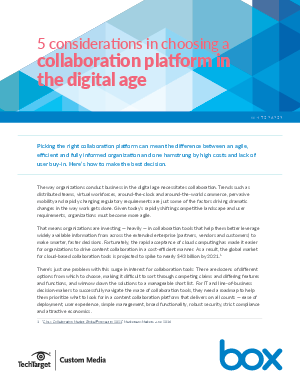 This eBook, 5 Considerations in Choosing a Collaboration Platform in the Digital Age, will walk you through the ins and outs of what to keep in mind as you choose the best collaboration platform for you.